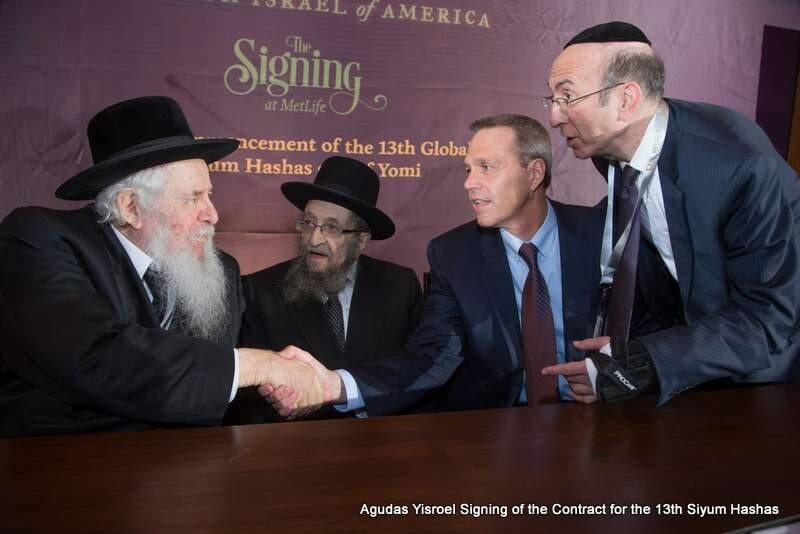 The atmosphere in the air was electric when the contract for The Siyum was signed by the Novominsker Rebbe and Rav Kamenetsky, on behalf of the Moetzes Gedolei HaTorah and the Agudah, and Mr. VanDeveen, on behalf of MetLife Stadium. 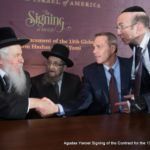 Participants erupted in spontaneous song, celebrating the jubilant moment that signified that the Daf Yomi program was entering its long awaited final stretch. The emotional undercurrent in the room was further amplified when Agudah board of trustees member Rivie Schwebel took to the microphone, singing Rav Meir Shapiro’s unforgettable composition Ashrei Adam Oz Lo Boch, a heartwarming tribute to the founder of the Daf Yomi.